starts singing professionally at the age of 17 as backing vocals but soon turns to the front-lines and begins a solo career in several bands, reaching often over two-hundred live performances a year! Born Dutch, raised in Italy and now based in Mallorca she's a real globetrotter and speaks fluently 4 languages. From reggae to rock to 70's-80's-90's all around cover bands and acid jazz groups, she becomes then a great interpreter of big soul names like A.Franklin, T.Turner and a lot of others which brought her to develop a strong, powerful and warm voice. It may seem she’s been seeking for success in the music business, but as a matter of fact her biggest input has always been passion: big passion for music (all kind of!!!). (Rachmaninoff, Tchaikovski, Mozart, Beethoven, Mahler and Sibelius). Mother Maureen was playing a lot of music as well..... (Joni Mitchell, Cat Stevens, Fleetwood Mac, Elton John, Stevie Wonder, Earth,Wind & Fire and many more). On high school Sharon joined a new wave band called Half Moon and this would sign her final entry to the wonderful world of music. Her very first concert took place on April the 12th 1986. After 2 years she became part of most famous italian reggae band Africa Unite, with whom she performed as backing vocals for about two and a half years, participating to their 2nd and 3rd album 'Llaka!' and 'People Pie'. In 1990 Sharon sang as backing vocals for 3 tracks on italian artist Paolo Conte's album “Parole D’Amore Scritte A Macchina”. In the meantime she started her 6-year experience as backing vocals and, for the first time lead vocals, in the all-around cover band APPALOOSA GROUP, reaching a huge number of live performances, playing all over Italy. In the early 90’s she starts recording lots of tracks in the upcoming house genre and develops creativity by writing lyrics, including, from that time on, the producing aspect of music. She build up an amazing experience in recording studios and gained a lot of collaborations due to her ability in writing and recording in a very fast tempo! Sharon never stopped performing live in small clubs and live music bars; she had some interesting times in holiday locations singing for several months in 5 stars hotels such as Bravo Mandarin Club (Playa Del Carmen) and Hilton (Cancun). Nowadays she still keeps this up in luxury hotels throughout Mallorca, where she's based currently. Her amazing large repertoire makes her a very much requested artist both for weddings and luxury-lounge private parties. In 1996 she faced the house music scene and began her experience as freestyle vocalist. With her powerful black voice and her very charismatic performances, she also became most wanted free-style vocalist of Italy for many years working with a huge number of world known house-music djs, throughout the best clubs, first in Italy and then also Ibiza, Mexico, England, Poland, Switzerland, Romania, Russia, the Netherlands, Spain, France, Albania, Dominican Republic, Egypt, Siberia, Kazakhstan, Germany, Dubai, UK and many more. After gaining some worldwide hits like Destination Calabria (Sharon wrote the topline and is the voice supporting Crystal's) and Little Love, working with Alex Gaudino, she still performs nowadays as special entertaining guest in a large number of clubs over the whole globe with a smashing show, thanks to her huge number of own projects. Sharon released many tracks (see "Discogs") and is currently working on new productions (see "News") amongst other musical genres. 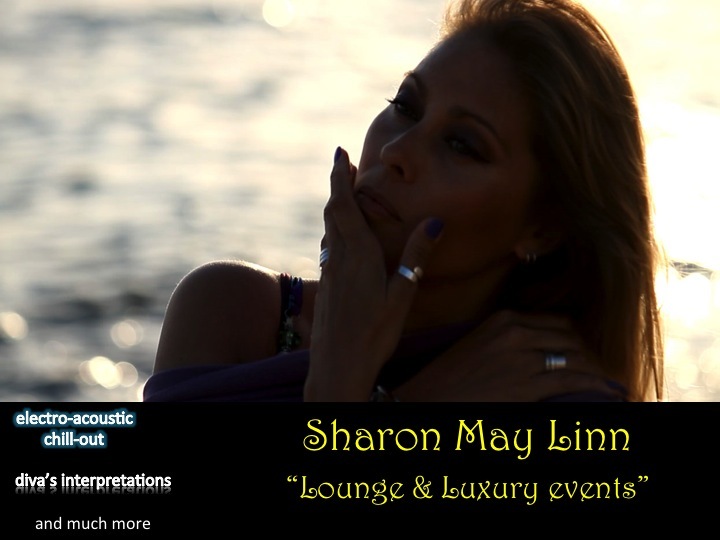 Not only can you follow Sharon May Linn in her songwriting and producing career into house, nu lounge and chill-out, but also as a lead voice with historical italo-house group FPI Project. ​Keep updated with her shows!